Republican Doug Ducey is opening up his lead over Democrat Fred DuVal in the tight Arizona gubernatorial race, according two recently released surveys. RCP now rates the race “leans GOP,” a change from the “tossup” designation assigned to the contest shortly after the August primary. Ducey earns 47 percent of the vote to DuVal’s 42 percent, according to Rasmussen Reports. Third-party candidates garner 3 percent, and 7 percent remain undecided. 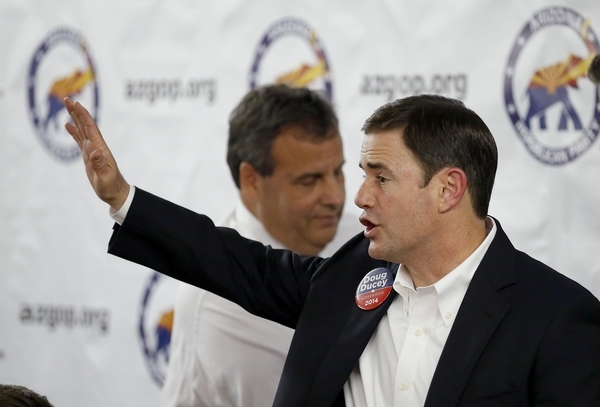 A separate poll, conducted by the Tarrance Group, shows Ducey winning by a wider margin, 43 percent to 36 percent. Libertarian Barry Hess took a 5 percent share of the vote in that survey. Independents, Arizona’s largest group of voters, break evenly between Ducey and DuVal in the Tarrance poll. DuVal will need to peel off a bigger share of independent voters in order to remain competitive in the conservative state. The surveys conflict with a poll conducted for the Republican Attorneys General Association, which showed the race to be a virtual dead heat. While Republican groups (or Republican-leaning pollsters) directed all three surveys, the Rasmussen and Tarrance polls align more strongly with underlying trends -- which favor Ducey -- in Arizona. The Rasmussen survey of 1,056 likely Arizona voters was conducted Oct. 14-16 and has a margin of error of plus or minus three percentage points. The Tarrance Group survey of 500 likely Arizona voters was conducted Oct. 13-16 and has a margin of error of plus or minus 4.5 percentage points.